Rice is pressure cooked along with moong dal till rice is soft. A tempering / talimpu is prepared with cumin seeds, black peppercorns and curry leaves. The rice is then tempered with the spices and served with coconut chutney or with onion chutney and sambar. Makes: around 3 servings of Ven Pongal. Crush the cumin seeds and keep aside. Crush the black peppercorns coarsely and keep aside. Tear curry leaves if they are too big. Wash rice and moong dal together with fresh water and strain. Pressure cook rice and moong dal together in a pot with 3 cups of water for 3 whistles. Leave the cooker for 10 minutes for pressure to release. Uncover, add salt, 2 curry leaves, a pinch of crushed cumin seeds and a cup of water. Stir well and leave the cooker on low flame. Heat ghee in a pan, add cumin seeds. When cumin seeds starts to change color, add crushed black peppercorns and curry leaves. Fry till black peppercorns turn light golden brown and remove from heat. Add the above tempering to the pressure cooker. Cook for 3 – 5 minutes on low flame and remove from heat. Serve ven pongal with simple onion chili chutney. Notes: Make the onion chili chutney with tamarind in place of lemon juice. Actually i was pulled to prepare this thick smoothie coz of some leftover seedless dates and some leftover fruits salad prepared by my hubby sterday..Am a person who never trashed anything that much easily, so i wanted to turn those leftover fruits as a thick smoothie using yogurt, this smoothie is completely sugar free,filling, delicious which suits prefectly for breakfast to start a hectic day with some bread toasts or for dieting people as this smoothie is quite a complete energy booster...Just add some ice cubes to this thick smoothie to serve them as a thin juice, u have so many choices to enjoy this healthy smoothie.. Blend the soaked dates with enough water as thick paste, add the remaining water, mixed fruits, yogurt and blend everything together as thick smoothie, enjoy immediately or with ice cubes..
Making out puree with veggies is quite usual in French cuisine, before i dont even know how to make delicious puree with veggies but after learning through my french friends, now i can prepare puree with any sort of veggies for our lunch or for our dinner, usually i serve puree with grilled meats or spicy chicken pieces or with a simple creamy mushroom sauce which goes awesome along with puree ..Day before yesterday i prepared this creamy green peas puree with frozen green peas, fresh cream, potatoes along with onions and vegetable stock water..U can also prepare this same puree for babies just by avoiding cream,onions and vegetable stock water..Sending to A Fruit/Veggie For A Month - Green peas guest hosted by Richa,event by Priya Mitharwal..
Heat the butter and sauté the chopped onions until they turns transculent, add immediately the green peas,chopped potatoes, sauté for few minutes, add the vegetable stock water, salt and cook everything in simmer until the green peas and potatoes get well cooked, finally add the fresh cream,pepper powder and blend as a creamy puree with a hand blender.. Serve warm with grilled meats or a creamy mushroom sauce..
Am very excited to send my two best recipes to 30 Best Recipes of 2009 going through at Chacko's Kitchen, this event is quite interesting for me since i have numerous list of dishes which are very special for me since cooking is one of my great passion..This interesting event was holded by 5members and they have their particular selection criteria for choosing 30best recipes from the numerous entries..
Am gonna send my Chandrakala & Sweet Almond Buns with fingers crossed.. So far, I have made chocolate pie. Scalloped potatoes are assembled but need to be baked. I am chopping veggies for the salad. Sweet potato dough is resting. Wish me luck! As I woke up this morning, I opened the fridge to make a hearty breakfast. I found a frozen packet of Southwestern veggies blend (black beans, bell peppers, onions, corn). Now, nothing is more satisfying than a hot plate of pohe for us. So decided to add the veggies to this pohe and voila! we really liked this combo. Looks like we just created a new tradition for Thanksgiving breakfast. I served it with hot tea and cut cantaloupes. 1. Heat oil in a saucepan. Add all the ingredients for tempering. Saute till onion is soft. 2. Add all the veggies. Stir fry for 2-3 minutes. 3. Add drained pohe, salt, sugar. Mix well. 4. Cover and keep cooking on a low flame for 5 minutes. 5. Garnish with coconut and cilantro. 1. Black beans are precooked in this recipe. Its too cold here also its getting dark everyday at 4pm, most of our snacks goes for hot cup of tea or coffee, finally after a long hesitation i prepared this chickpeas and bread masal vadai with some soaked chickpeas and stale bread slices..For my surprise this masal vadai turned out super crispy and delicious..We enjoyed having this crispy beauties with a hot cup of tea..Simple masal vadai goes prefect along with some spicy coconut chutney or else with rice dishes...Needless to say that from now there wont be stale breads anymore at home, am gonna try this masal vadai with different beans,yeah we loved this crispy vadai that much..
Heat the oil for deepfrying..make small balls from the vada batter and flatten them..drop gently the flattened vadais to the hot oil and fry until they turns golden brown..
Vangibhath is one of the famous Karnataka rice dish usually prepared with a special spice powder, eggplant chunks and cooked rice, for a change i choosed this time some cooked quinoa to replace the rice and prepared this delicious,filling and healthy one pot meal which suits prefect for a lunch or for dinner..As most of u would have know that am a great fan of both oats and quinoa, i never stop trying and enjoying our traditional foods by using either oats or quinoa,this quinoa vangibhath is one among those trials which turned out really super delicious ..Am really happy to say that even my teddies and my hubby enjoyed this quinoa vangibhath for lunch with spicy potato fry and boiled eggs.. Enjoy with potato chips, fries or with eggs..
Are you wondering about the name of the post or the dosa name, come on i will tell you all about it in next few lines. Raja Raja Chozhan, a Tamil King, who had build the famous Tanjore Big Temple. This Year 2010, the Tanjore Big Temple completes 1000 years. In such a Celebration Time, one of Uduppi Restaurant in Chennai, Pondy Bazaar, called Matsya, is celebrating the occassion, by giving the name of the king Raja Raja Chozhan to a Good Dosai. if you have not visited the tanjore Big Temple, Please do visit the temple in evening. with full moon or with moondraam pirai, it will be a pleasure to see the temple. According to me Tanjore is the Best place to taste authentic Tamil Food. Whoever have read Ponniyin Selvan, a novel written by kalki, will sure loved the characters of the novel. My favourite characters in the novel are Raja Raja Chozhan, Poonkuzhali, Vanthiya devan, Kundhavai, Aazhvar kadigan and at last Nandhini. Yesterday, i tasted this dosai at Matsya restaurant, and today i prepared and am blogging it now. Its the casual stuffing other than potato masala. the stuffing has onion, tomatoes and capsicum. it may sound simple, but it has a different taste, that will make you crave for another dosai. Finally a tsp of Ghee. Heat a Pan, add 1 tsp oil and heat it. add mustard and let it splutter. add finely chopped curry leaves, green chilli and onion and fry them well. Add finely chopped tomatoes and fry it too. 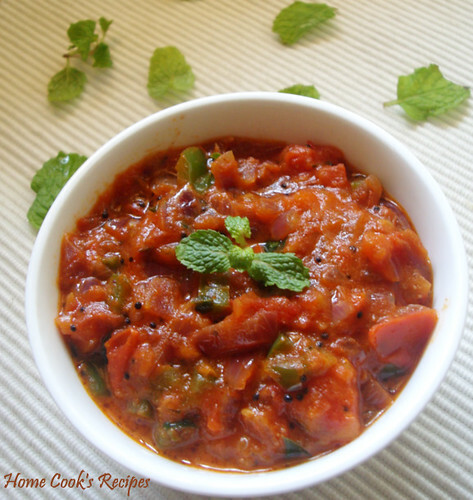 add finely chopped capsicum's and mix along with onion-tomatoes. add salt to taste, add chilli powder, corriander powder and mix well. Try to mash the tomatoes and capsicum and mix together. add very little water to get the consistency, as shown in the above pics. finally add a tsp of ghee and remove the stuffing from flame. 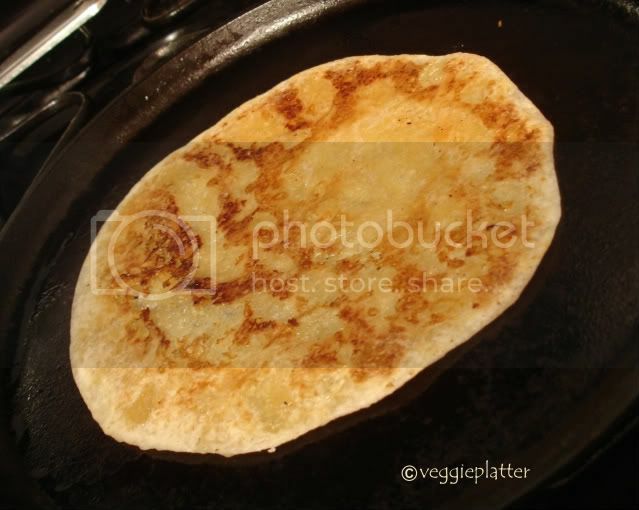 Prepare dosai's and spread 2 tsp's of stuffing in the centre of the dosai and fold it to get the traingle shape. 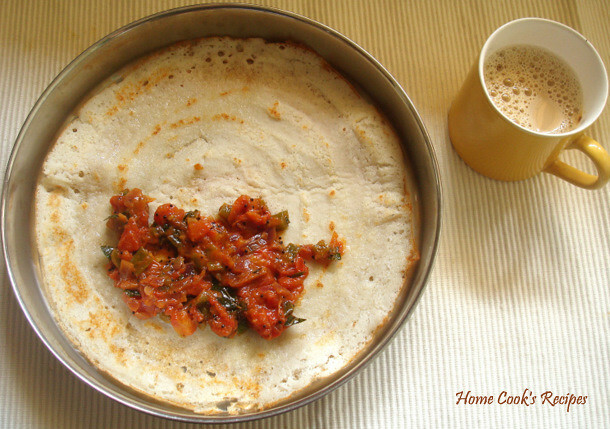 serve it hot with coconut chutney..
We enjoyed this dosai very much. do try this and enjoy it. 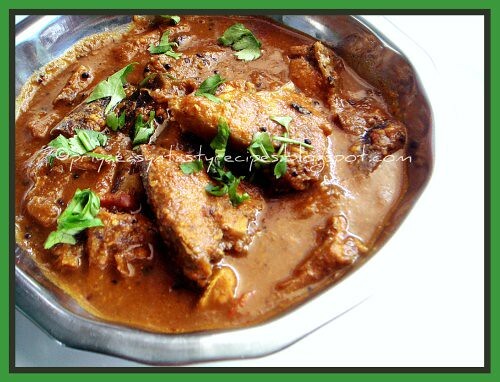 One among the few dishes, which I like to eat but not to cook is this Mutton Brain Curry. Rarely, we get mutton brain here and this weekend pravin was very fortunate to get them. Very rich & heavy dish taste great with rice and chapathis too. 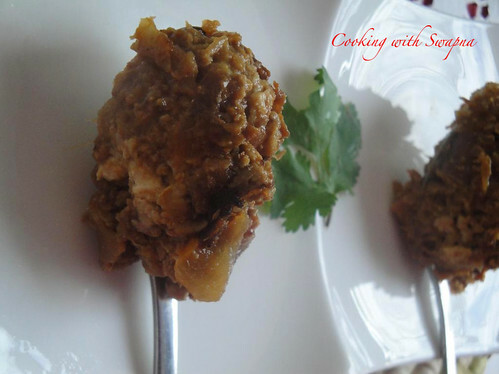 Pravin made it very simple with little ingredients yet taste simply delicious. Leftover if any, can be used as a stuffing inside the cutlet. 1. Clean the brain (remove the outside thin layer). 2. Heat oil in the pan, add cinnamon stick, cloves & finely chopped onions. Saute till tender. 3. Add turmeric powder, chilly powder & salt to taste. Cook for 10 mins over low medium flame. 5. Garnish it with corriander leaves. Bell pepper is sliced and cooked in tempered oil along with sliced onion. Peanuts are roasted with red chiles and ground into fine powder. Finally the powder is mixed with bell pepper and steamed basmati rice. Serve capsicum rice with any raita of your choice. Makes: around 2 Servings of Capsicum Rice. Wash, remove stem, discard seeds and slice the bell pepper into 2 inch long strips. 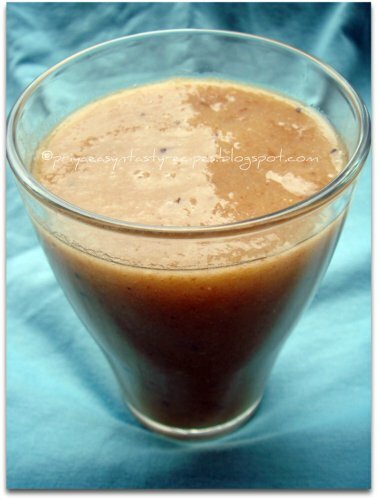 Soak tamarind in few tablespoons of warm water and extract all the juice discarding the veins. Cook basmati rice in 1 1/2 cups of water till all the water has been absorbed by the rice. Heat two tsps of oil in a pan, add raw peanuts and fry till peanuts turn golden brown. Remove the peanuts from heat, add broken red chiles, cumin seeds and fry till red chiles change color and crisp up. Remove the red chiles from heat and cool the ingredients to room temperature. Grind the peanuts, red chiles, cumin seeds and salt into fine powder. Heat tsp of oil in the pan, add mustard seeds and curry leaves. When mustard seeds start spluttering, add bell pepper and onion. When onion turns translucent and the bell pepper turns little soft, add the peanuts powder. Stir well and add tamarind extract and salt. Mix well and stir in cooked basmati rice and cilantro. Serve capsicum rice with any raita of your choice. Notes: Make sure not to overcook the bell pepper. Pastas are our family favourites, we guys can survive with pastas for many days,yep we love that much, even i cook everyday pasta, its never gonna be boring for us..Our sterday lunch was this garlicky broccoli elbow pasta which i served along with grilled tofu bites..This pasta dish goes for simple,quick and for easy cooking process, u just need few garlic cloves, crushed tomatoes, broccoli florets,cream, cooked pasta,salt and pepper powder, in case if u need them more hot just add few pinches of red chilly flakes,voila the dish is ready to enjoy with any sort of grilled meats or veggies or just with grilled spicy tofu bites as i served along with this pasta..Am sending this pasta to Presto Pasta Nights#191 guest hosted by Denny,event by Ruth..
Heat enough olive oil, fry the crushed garlic cloves until they turns golden brown, add immediately the crushed tomatoes, salt and cook until the tomatoes turns mushy,add immediately the broccoli florets, sauté for few minutes,now add the pepper powder and cream..cook for few minutes, finally add the cooked elbow pasta, toss everything gently until the pasta & veggies get well mixed.. Serve warm with grilled meats,veggies or tofu bites.. Equal ratio of maida and rice flour is made into thick batter with yogurt. The mixture is seasoned with spices and herbs. The batter is then scooped up and dropped into hot oil and fried till golden brown in color. 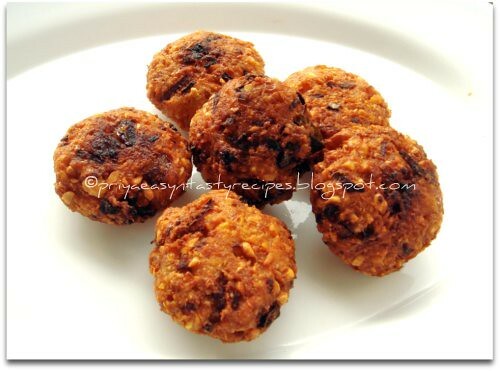 Serve yogurt bonda with onion chutney or with any chutney of your choice. 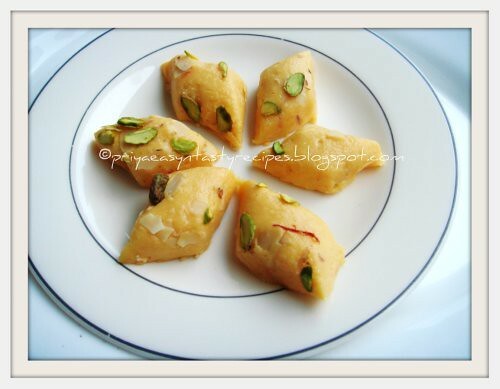 Makes: around 10 Yogurt Bonda. Soak chana dal in water for around 3 hours and strain the dal. Wash and tear the curry leaves into small pieces. Stir in chana dal, onion, green chile, cumin seeds and curry leaves. Heat oil in a heavy deep pan on medium high heat. When oil gets hot, carefully drop a small scoop of the mixture into the oil. Repeat till the surface of the oil is filled up. Deep fry till the bonda turns light golden brown in color. Carefully remove the yogurt bonda onto a absorbent paper. Repeat the same with any remaining mixture. 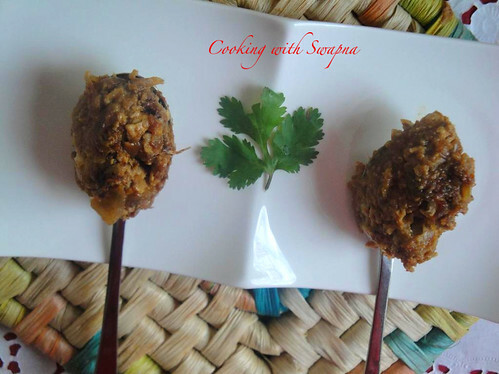 Serve yogurt bonda with onion chutney. Notes: Make sure to fry the bonda in medium hot oil to make sure the inside is cooked well. Actually my fridge was completely empty today.. Eventhough i wanted to make an easy breezy dish with some frozen veggies but something special for our sunday lunch, while just going through my freezer i got a packet of frozen peas, since a long i wanted to try tawa pulao coz i have to finish the already opened pav bhaji masala packet as its was sitting sadly in my pantry since a long, finally i went for preparing a simple,quick,delicious matar tawa pulao..I know this pulao will be very colourful if i would have added few carrots, capsicums or some beans..Anyhow this simple matar tawa pulao turned out our sunday lunch truly fabulous with some grilled chicken bites..Sending to A Fruit/ Veggie For A Month guest hosted by Richa, event by Priya..
Heat enough oil, fry the cumin seeds until they turns brown, add immediately the chopped onions,chopped tomatoes sauté until the onions turns transculent, add the ginger garlic paste to the veggies, sauté until the raw smell goes on..add the frozen peas, pav bhaji masala, sauté for few minutes, add some water and cook until the water gets evaporated..Now add the cooked rice, salt, lemon juice and toss everything gently until everything get well mixed in high heat..put off the stove immediately.. Serve with potato chips or any sort of meats..
Makes: around a Cup of Apple Pickle. Wash and grate the apple on thicker side of the grater. In a mixing bowl, add roasted fenugreek seeds powder, red chile powder and salt. Mix thoroughly and add grated apple, mustard seeds powder and lemon juice. Heat oil in a small pan, add all talimpu ingredients in order. 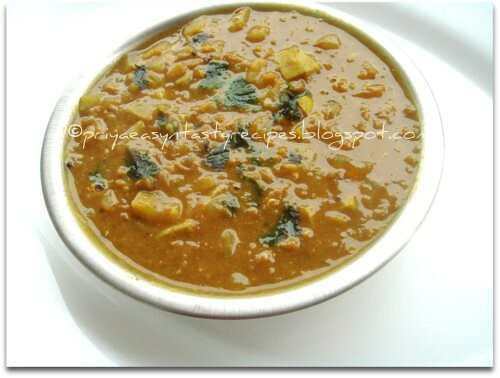 When chana dal changes color, remove from heat. Let the oil cool to room temperature and add to above pickle bowl. Give the pickle a good stir and store it in a tight jar. Ready to use after a few minutes of standing time. This apple pickle stays for few days if refrigerated. Notes: Make sure to choose raw apple with less moisture. 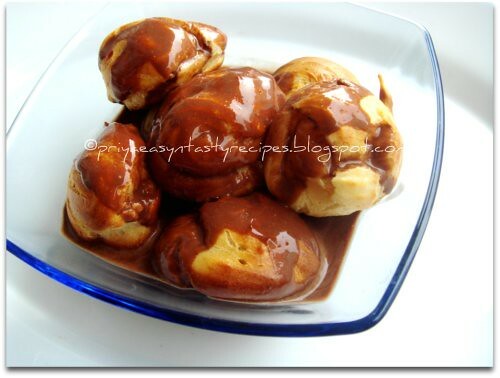 Profiterole is a dish prepared with pastry balls filled either with whipped cream, pastry cream or simply served along with chocolate sauce..This dessert is quite common in France and i'll get them usually from supermarket, this time i wanted to make them at home that too with nutella spread as a smooth chocolate sauce using some low fat cream, u can serve this profiterole just by dusting powder sugar, either with caramel or with chopped fruits else with a simple chocolate sauce, since am a chocoholic person my choice went for this quick and delicious nutella chocolate sauce..This pastry balls goes for the same prepartion and baking procedure exactly like Chouquette, just u need to skip the sugar pearls that all...Sending this yummy profiteroles to AWED-French guest hosted by me, event by DK..
Preheat the oven to 350F, add the water, milk,sugar, butter in a pan and bring them boil in medium flame; once the butter gets melts, take the pan from the flame and add immediately the flour,mix well and cook in simmer again until the dough get stiff.. Transfer this dough to a large bowl, add the beatened eggs one by one until the dough turns like puree but slightly stiff, now fill this dough in a pastry bag and pipe out small quantity of this dough over a baking sheet lined in a baking tray, slightly brush the chouquette with beatened egg yolk and bake them in middle rack for 20minutes..
Heat the cream in simmer, add the nutella spread and confectioner's sugar, once everything get well mixed, put off the stove..Pour this chocolate sauce in a serving bowl, arrange the already prepared pastry balls and pour few teaspoons of this chocolate sauce over the pastry balls and arrange in fridge..Serve chilled..
Rice always takes the central stage in a traditional, South Indian kitchen. 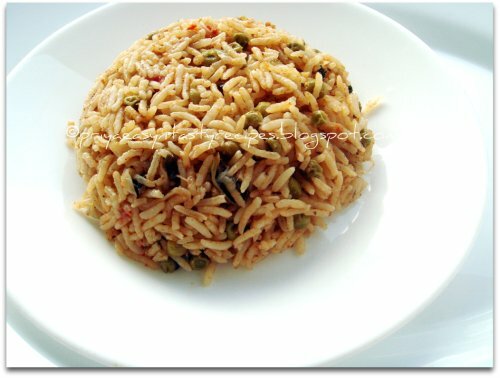 Especially on a festive day, an elaborate and delicious rice dish is a must in most of the homes there. When there are ten other things to savor on a festive day and thousand other things to wreck our brains, I feel a simple rice dish would be sensible enough to suffice the need. Even simple lemon rice becomes special if only prepared on certain occasions and not every time you have that leftover rice. My mother followed the same principle and so for us to this day, lemon rice is something to celebrate. 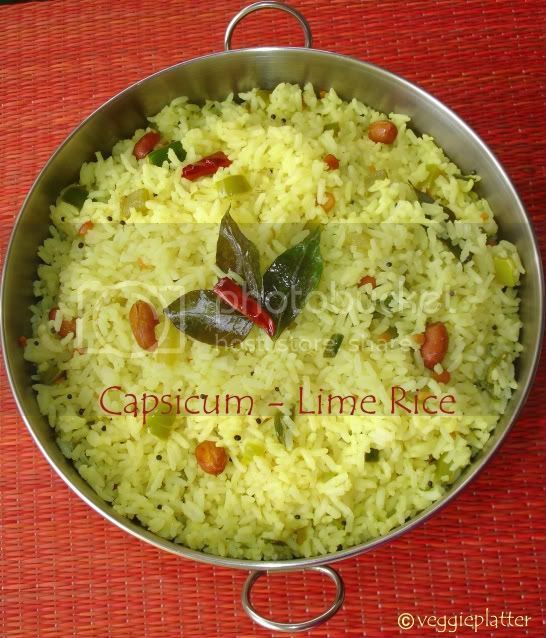 To make it more special, I had borrowed the idea from Karnataka cuisine - the addition of capsicum to the classic Nimbe hannina chitranna (Lemon / Lime rice) and present this capsicum - lime rice today. * Wash the rice and drain. Add 4 cups of water and cook in a pressure cooker. * Heat the oil in a kadai or a deep-bottomed pan and add all the tadka ingredients (except the turmeric and asafoetida) in the order mentioned. When they start to splutter and the dals turn reddish, add the chillies and fry for a few seconds. Then add the capsicum, turmeric and asafoetida. Cover and cook on low flame. It would take around 5 minutes for the capsicum to cook. Turn off the stove. * Now add the cooked rice, salt and limejuice to the pan and mix well. Taste and adjust the salt & limejuice levels if needed. Remember that the salt & sourness levels decrease after the resting period during which the rice would have absorbed the flavors. Let it rest for at least 30 minutes before serving. Priya's Complete my thali - Rice, an event by Jagruthi. Preeti's Only Festive Food, an event started by Pari. Makes: around 1 Cup of Sunflower Seeds Chutney. Roast the sunflower seeds on low flame till they turn golden brown in color. Add few drops of oil to the pan, add red chiles, cumin seeds, tamarind and roast them for couple of seconds. Grind the red chiles into fine powder along with cumin seeds. Then add the roasted sunflower seeds and grind again into fine powder. Finally add the yogurt, salt and grind into smooth paste. Remove the chutney onto a bowl. When mustard seeds start spluttering, remove from heat and add to the above chutney bowl. Notes: Make sure to roast the sunflower seeds well. Suggestions: Adjust the consistency of the chutney with water. Variations: Add cilantro to the tempering if desired. Other Names: Sunflower Seeds Chutney. Idli batter is prepared with idli rice and urad dal. Here, idli batter is tempered with spices (cumin, peppercorns) and dals (chana dal) just before steaming the batter. 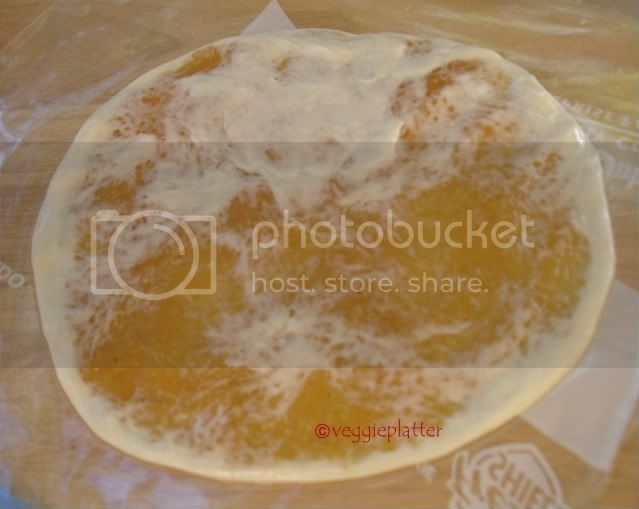 Traditionally, the batter is steamed in wide deep vessel rather than using regular idli stand. Serve kanchipuram idli with tomato chutney. Makes: around 6 Kanchipuram Idli. Soak both idli rice and raw rice in water for around 6 hours. Grind the both urad dal and rice separately into smooth paste. In a mixing bowl, combine the urad dal paste and rice paste. Let the batter ferment for good 6 – 8 hours in a warm place. Wash, remove stems and finely chop the green chiles. Lightly crush the ginger and green chiles. When chana dal changes color, add ginger and green chiles. Fry briefly and remove the tempering from heat. Then, add the yogurt, salt and the above tempering to the idly batter bowl. Mix well and let it stand for around an hour. Place a cashew first and fill the moulds with kanchipuram idli batter. Let them cool off a bit before removing the idli from mould. 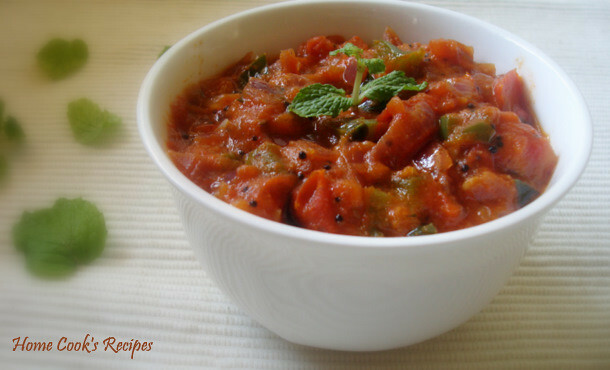 Serve kanchipuram idli with tomato chutney. Notes: Make sure to to soak the rice well to aid in easy grinding. Suggestions: Usually the kanchipuram idli batter is steamed in a wide deep pans or cups rather than using the regular idly moulds. Variations: You can also add urad dal and asafoetida to the tempering. Other Names: Kanchipuram Idli, Kanjeevaram Idli. Here, onion is chopped up and briefly cooked before grinding into paste with ginger and garlic. 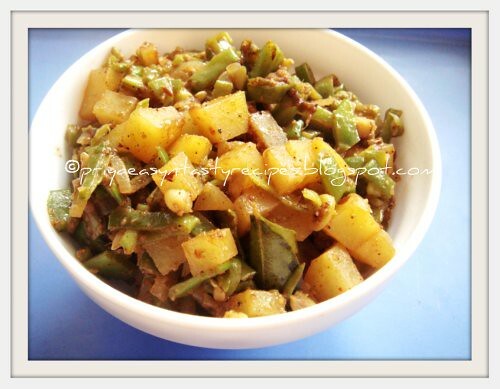 Ridge gourd is chopped into small cylinders and stuffed with the ground onion mixture. Then stuffed ridge gourds are cooked in tempered oil till soft and finished with kasuri methi. Serve onion stuffed ridge gourd with steamed rice or with roti. Makes: around 6 Onion Stuffed Ridge Gourd. Wash, remove ends, lightly peel and chop ridge gourd into 3 inch long cylinders. Taste the ridge gourd to make sure its not bitter. Peel and roughly chop ginger and garlic cloves. Heat a tsp of oil in a pan, add chopped onion and fry till onion turns translucent and starts to brown. Cool the onion to room temperature and grind it along with ginger, garlic, green chiles and salt. Add a splash of water while grinding if necessary. Remove the thick onion paste onto a bowl. Stuff each ridge gourd with a tbsp of more of the prepared onion paste and keep aside. When mustard seeds start spluttering, slowly place the stuffed ridge gourd pieces into the pan. Fry briefly for a minute or two and pour any remaining onion paste into the pan. Cook covered on low flame turning occasionally until ridge gourd becomes soft. Add a splash or two of water if necessary while cooking. Finally uncover and stir in dried fenugreek leaves / kasuri methi. Stir fry for a minute or two and then remove ridge gourd from heat. Serve stuffed ridge gourd with steamed rice and a dollop of ghee. Notes: Make sure to occasionally scrape the bottom of the pan when the pan is on high heat to avoid burning of the onion stuffing. Suggestions: If ridge gourd is not cooked properly, cook it covered over medium – low flame till soft but not mushy. Variations: Spices Stuffed Ridge Gourd, Besan Stuffed Ridge Gourd are some good variations of stuffed ridge gourd. Other Names: Onion Stuffed Ridge Gourd. Spices and dals are roasted in oil till golden brown and ground into fine powder using a spice blender. Large eggplant is roasted on direct flame till its charred. Then the roasted eggplant pulp is mashed with ground spice powder and garnished with cilantro and curry leaves. Makes: around 2 Servings of Roasted Eggplant Chutney. Wash and finely chop the curry leaves and cilantro. Heat half a tsp oil in a pan, add mustard seeds, cumin seeds, chana dal, urad dal, coriander seeds and red chiles in order. Fry till aromatic or until all the ingredients are golden brown. Cool the ingredients to room temperature and grind into fine powder along with tamarind and salt. Place the eggplant directly on the low flame turning occasionally until the skin is completely charred on all sides. Cool the cooked eggplant and remove the charred skin with the help of wet hands. Discard stem and remove the roasted eggplant onto a bowl (around 1 Cup). Pulse the roasted eggplant pulp, ground masala powder and salt briefly for 5 seconds. Remove the eggplant chutney onto a bowl and garnish with curry leaves and cilantro. Serve roasted eggplant chutney with steamed rice or with roti. Notes: Make sure eggplant is cooked well while roasting. Suggestions: If eggplant is not cooked well, put it back on heat or cook covered in a pan till done. Variations: You can also temper the chutney with mustard seeds and curry leaves. Other Names: Roasted Eggplant Chutney, Kalchini Vankaya Pachadi. Cauliflower is boiled or steamed till slightly soft. 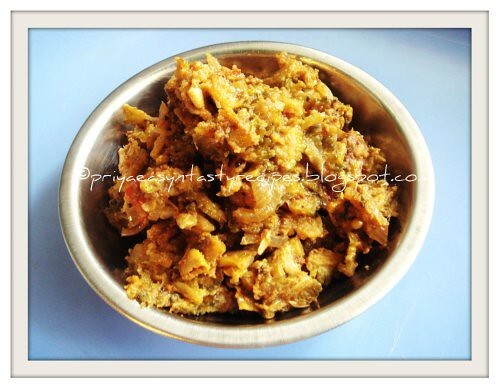 Besan / Senagapindi is toasted till golden brown and other spices and herbs are mixed with it. Oil is tempered with spices and cauliflower is briefly fried on high flame with prepared besan and spices mixture. Once the cauliflower absorbs all the flavors, it is served with steamed rice or with roti. Makes: around 3 Servings of Cauliflower with Besan. Cut off the leaves and hard stem, break cauliflower into small florets and thoroughly wash them under running water. Bring to boil few cups of water, add cauliflower florets and a big pinch of salt. Boil till cauliflower turns just soft and strain the cooked cauliflower. Alternatively, steam the washed cauliflower florets. Heat a pan on low heat, add besan and fry till raw smell of the besan is gone and it turns golden brown in color. Remove the toasted besan onto a bowl. Add amchur powder, turmeric powder, red chile powder, ajwain, cilantro and salt to the besan powder and mix well. Heat oil in a pan, add all other talimpu ingredients in order. When mustard seeds start spluttering, add cauliflower florets and besan mixture. Add a splash of water if necessary to allow the besan powder to stick to the cauliflower florets. Stir fry till the cauliflower is completely coated and starts to turn brown around the edges. 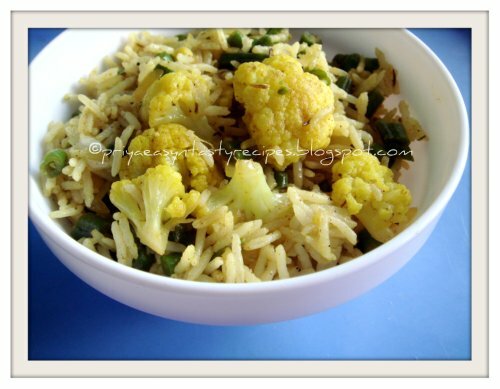 Remove from heat and serve cauliflower with besan over steamed rice or wrapped in roti. Notes: Make sure not to over cook the cauliflower. Suggestions: If cauliflower is not cooked properly, add few tablespoons of water to the curry and cook it covered on low flame till done. Variations: You can also check the varieties made with cauliflower. Other Names: Cauliflower with Besan. Whole wheat is roasted in little bit of ghee till golden brown. Then its ground into powder and mixed with powdered sugar and nuts. The mixture is made into small balls with few drops of milk or ghee. While ghee enhances the shelf life, milk is less calorie rich. Makes: around 10 Whole Wheat Laddu. Break cashews into small pieces. Grind sugar into fine powder and keep aside. Heat ghee in a pan on medium heat, add cashews and raisins. Fry till cashews turn light golden brown and raisins plump up. Remove the fried ingredients onto a plate. In the same pan with remaining ghee, add whole wheat. Roast the whole wheat until its aromatic and dark golden brown in color. Cool the roasted whole wheat to room temperature. Grind the whole wheat into fine powder using a spice blender. Grind the whole wheat in batches to make it easy on the blender. Make one of the batch little coarse than the rest for texture. Remove the whole wheat powder onto a mixing bowl, add sugar, cashews and raisins. Add milk to the above mixture and form it into lemon sized balls. Store the whole wheat laddu in a dry jar and these stay for upto a week. Notes: Make sure to roast the whole wheat right. Suggestions: Adjust the milk according to the mixture. Variations: You can also add fresh or dry coconut to the powder. Other Names: Whole Wheat Laddu, Godhuma Laddulu. Yes, I have saved the best for the last part of my CFK. I grew up and have spent two thirds of my life in a state where every celebration, bigger or smaller is impossible with out holige / obbattu on the menu. It would have been a shame if I had not posted a holige recipe when I am hosting an event that is dedicated to festive foods. I see all Kannadigas nodding their heads. :) Holige plays a major role in Karnataka cuisine and this delicacy enjoys a 'royal' status there. 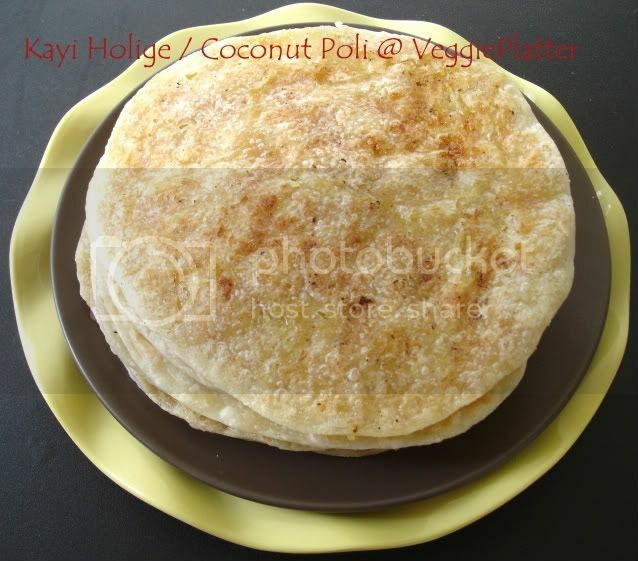 'Holige oota' - The food including these sweet flatbreads is considered to be the ultimate feast one can serve to their guests. Festivals, engagements / marriages, graduations, welcoming home a new son-in-law or a baby, a new home / job (for that matter, any reason under the sun that one can think of that has brought joy to life) has to be celebrated with these holiges, of course lovingly prepared by dear mothers or chefs if prepared on a big scale! Holige making is considered an art and usually the job is reserved to the experienced matron figure of the family. As I mentioned above they are flat breads with a sweet stuffing. The usual traditional stuffing can be pureed toordal / chanadal or coconut ones sweetened with jaggery and flavored with aromatic cardamom. Usually when moongdal filling is used, sugar is the preferred sweetener. I have noticed that even a traditional poli could become versatile depending upon one's creativity and experiments. 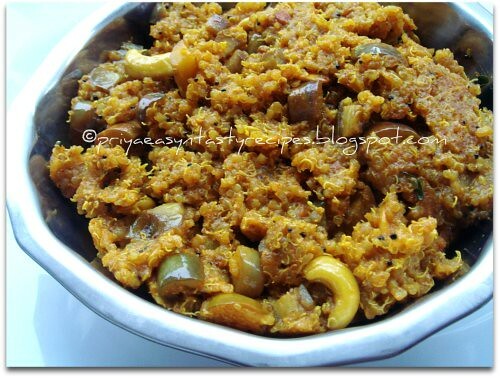 Now coming back to the traditional ones, kayi holige or kayobbattu is said to be one of the tougher ones to nail down. They are supposed to be wafer thin and some experience helps in perfecting them. My mom usually prepares and prefers coconut stuffed ones since they can be stored longer, about a month or so with out any refrigeration. Some stores in Bangalore sell them in plastic packets because of their long shelf life. The outer layer uses the chiroti rave along with maida. Chiroti rave happens to be finer semolina than the regular version that is used to prepare upmas. As the name suggests, it is used in preparation of another delicacy from the state, chirotis. Chirotis happen to be one more sweet delicacy from Karnataka and usually appear on wedding menus. Their preparation is left to seasoned chefs since the preparation process happens to be an elaborate one. The following ingredients make around 22 obbattus. My mother though added the ingredients for the stuffing and the dough with out any measuring tools, they were perfect. We were not left with any of the stuffing or the dough. Since I don't do pictorial explanations, I didn't take pictures for each step. I will try to update the post with new images for a better understanding of the recipe. * It is important to note that the coconut needs to be very finely shredded. I had used the frozen, shredded coconut and since the gratings were larger, I just ran it through food processor for a minute so that it was finely shredded. Add everything to a thick bottomed or a non-stick pan and start cooking on medium low flame till it thickens. It took me around 25 minutes to cook it. To know whether it is done, do this test. 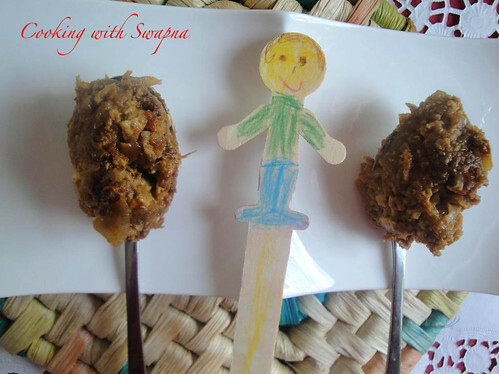 Take a tsp of the stuffing, make it into a ball and try to pat it on a plastic sheet with your fingers. You must be able to spread it with out any difficulty. It should not curl back. Let it cool. At this stage, either you can use it to prepare holiges or can refrigerate it to use later. It can be stored refrigerated for at least a couple of weeks. This step can hence be done very well in advance. Combine the flour and rava in a bowl. Add sufficient water (I added about 1 cup minus 1 Tbsp) and make a thick dough as roti / poori dough. Then add the oil gradually and keep kneading so that the oil gets incorporated well into the dough. According to my mother's instructions I kept kneading it for at least 15 minutes. My mother swears that this much of kneading (and the addition of that much of oil too) is really important and one shouldn't skip this step. 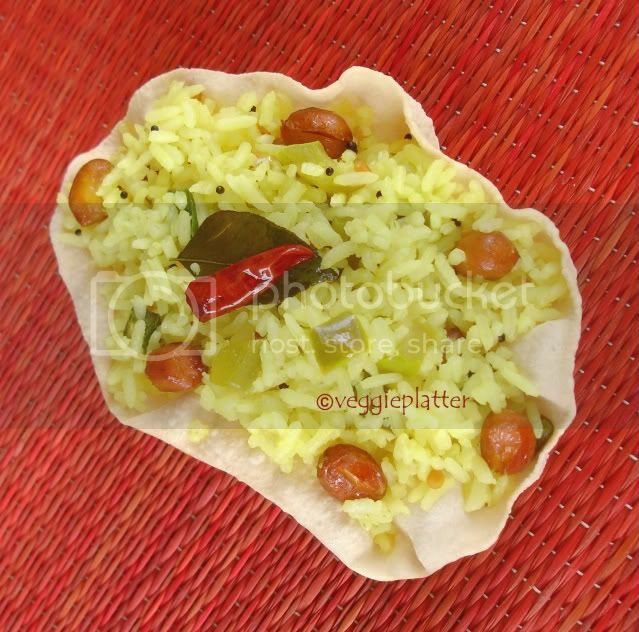 * Pinch about a small lime sized dough and place it on a greased banana leaf or a thick plastic sheet that is greased. * Now using your fingers, pat and flatten it into a thin circle of about 3 inch diameter. * Place about a lime sized ball of stuffing at the center of the dough circle. Bring the edges of the dough from all sides to cover the stuffing completely. Now the stuffing should be well inside the dough casing. * Again flatten it with your fingers and go on patting it carefully so that it results in a thin, flat circle with stuffing not spilled out. Take care that the edges have stuffing too so that you don't end up eating hard edges. * Meanwhile heat a griddle / tava / or a shallow pan. Now place the disc on it and fry it both sides till it is done by flipping it once or twice and adding a half spoon of oil / ghee around the edges while doing so. * Repeat the procedure with the remaining dough and the stuffing. You can prepare the discs and do the frying part simultaneously. 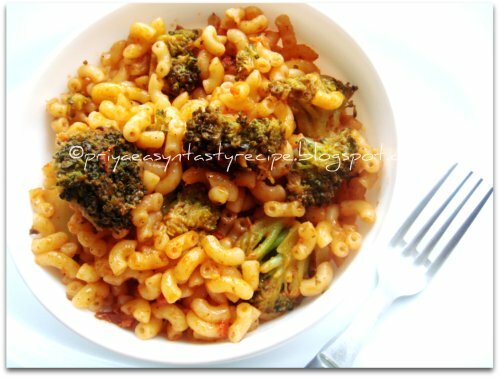 Enjoy them with a spoon of melted ghee. Cool the rest and store them in an airtight container. They remain good atleast for a month, unrefrigerated. I am really glad to send them over to my CFK - Festive Foods, an event originally started by Sharmi. Cashews are roasted till golden brown and ground into very coarse powder. The cashew powder and chopped cashews are then mixed with dalia powder and sugar. This mixture is rolled into laddu with help of ghee. Makes: around 8 Easy Cashew Roasted Gram Laddu. Grind roasted gram into fine powder using a spice blender. Heat a tsp of ghee in a pan, add cashews and roast them on low flame till golden brown in color. Cool the cashews to room temperature. Grind half the cashews into coarse powder and very finely chop the other half. In a mixing bowl, add cashew powder, chopped cashews, roasted gram powder, sugar and remaining ghee. Take a small handful of mixture and roll it into lime sized laddu with help of hands. Add another tbsp of ghee if necessary. Repeat the same with remaining mixture. Store the cashew laddu tight in a dry jar and they stay fresh for couple of weeks. Notes: Make sure to roast the cashews right. Suggestions: Add a few tbsps of milk instead of ghee to roll the laddu. Variations: You can also add roasted white or black sesame seeds to the cashew mixture. Other Names: Easy Cashew Dalia Laddu, Jeedipappu Putnala Pappu Laddu. Cabbage is shredded and cooked with onion and spices till soft with light crunch. Wheat flour in made into dough and the dough is rolled into roti. The roti is cooked on direct flame and is finally wrapped with the cabbage and the raita. Serve cabbage wrap immediately. Makes: around 2 Cabbage Wraps. Remove outer leaves and shred the cabbage. Wash and separate the cilantro leaves from thick stems. Fry briefly, stir in onion and cabbage. Fry till cabbage turns soft and starts to brown around the edges. Stir in salt and remove from heat. Knead wheat flour and a pinch of salt into tight soft dough using enough water. Roll each portion into thin 8 – 9 inch disk with help of a rolling pin. Heat a flat pan on medium heat, place the rolled out wheat roti on the pan. 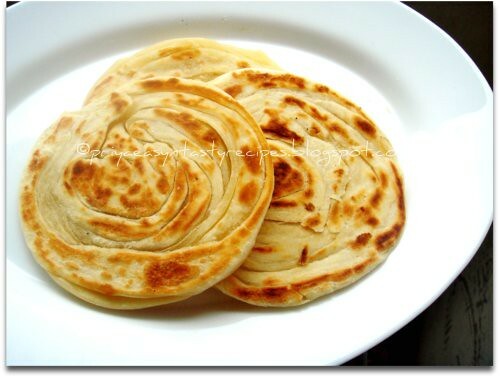 Let the small bubbles appear on the roti, turn on other side and leave for few seconds. Then place the roti on direct flame and turn frequently to let the roti cook. When brown spots appear on the roti, remove from the flame. Repeat the same with remaining portion. Spread 4 – 5 tbsps of the mango raita on the roti. Place a handful of cabbage mixture in the middle of the roti. Place two tomato slices and few cilantro leaves and sprinkle a pinch of salt. Wrap the roti and serve cabbage wrap immediately. Notes: Make sure raita is thick but be able to spread on the roti. Suggestions: Make sure not to overcook the cabbage. Season the tomatoes with black pepper powder for extra spice. Variations: Use your favorite raita in place of the mango raita. Murgh musallam, a droolworthy and catchy chicken curry from Awadhi cuisine..The word Musallam means “whole” and Murgh means “chicken” is a rich creamy dish chicken dish which is quite famous from Awadhi Cuisine. 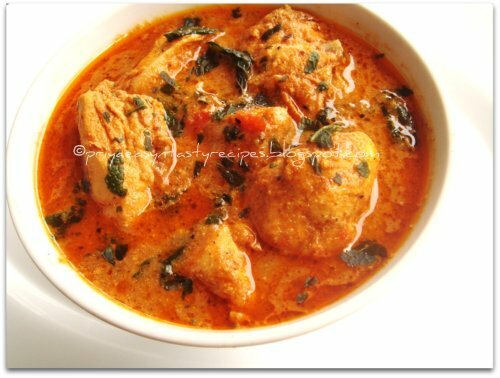 The dish has derived its name through the process of cooking whole chicken in a creamy sauce and an interesting combination of spices that result in a rich succulent dish that is mildly spicy and tastes amazing when paired up with plain cooked basmati rice, pulao or as a side to go with rotis. I used chicken pieces instead of whole chicken but the taste was delicious.The colour of the dish itself says how delicious this chicken curry would have tasted na, yep we enjoyed having this delectable murgh musallam with rice for our sunday's lunch and with rotis for dinner...One more delicious chicken curry to try and this curry is quite different from our usual chicken gravies...Eventhough the cooking process and the ingredients lists seems very long, this murgh musallam tastes truly soooo delicious, its really worth to try this dish.. Mix all the ingredients for marination,add cleaned chicken pieces to the mixture. Cover and let it marinate atleast for half an hour..
Dry roast the spices mentioned under 'to grind' on low flame till nice aroma comes out. Cool, grind to fine powder and set aside. Now grind the almonds with water to make into smooth paste,keep aside.Heat enough oil in a pan, add chopped garlic, chopped onions, and turmeric powder. Fry on medium flame for around 8 - 10 mts till the onions turn soft and light golden brown in color. Remove the onions, let it cool and grind to smooth paste. In the same vessel, heat some oil, add the marinated chicken pieces in the oil without the marination. Fry on high heat for about 5-7minutes till the chicken pieces turn lightly brown on all sides. Remove and set aside. In another vessel, heat few drops of oil, fry the bayleaves,shahjeera until they turns brown, add the onion paste, tomato puree, red chilli powder,a cup of water and cook on medium flame for about 5 minutes.Add the fried chicken pieces, left over marination,almond paste, and mix well. Add again enough water and cook covered on low flame until the chicken turns soft and the gravy turns slightly thick.. Finally add freshly chopped coriander leaves to the gravy.Serve hot with cooked basmati rice, biryani, pulao or rotis. A multi layered Indian flat bread quite familiar in Punjabi cuisine which tastes awesome when served along with chicken kurma or with channa masala usually this parathas are cooked in tandoor, the famous cylindrical clay oven which is quite a hard task for us to get here.. These parathas tastes and looks exactly like parotta but with minimum efforts this paratha tastes fabulous..This lachha paratha goes for flour, warm milk and oil, my teddies called these parathas as little sister of parottas since they looks exactly like our south Indian parottas..Lachha parathas are quite easy to prepare and its completely a filling dinner or lunch when served along with a spicy side dish..We enjoyed having this parathas with vegetable kurma, u can fold this parathas as many ways, i went for cutting the rolled dough as long strips and rolling them as likeswiss roll..once cooked, just push the sides of the paratha to release the layers and served them warm..U can conserve them very well for a day or two and serve warm by reheating them in a griddle or microwave oven..
Knead the flour, salt and a tablespoon of oil with warm milk, knead well as firm dough, brush the dough with oil and keep aside for an hour..Divide the dough as equal size portions and roll as circles..brush with some oil and sprinkle some flour over the rolled circles..Cut the circles as strips, arrange the strips one by one over themselves and roll tightly as a swiss roll..keep them aside again for an hour..now press lightly with rolling pin to give a round shape..
Heat few drops of oil, cook this rolled paratha on both sides by drizzling enough oil, until they get cooked well, once get cooked just push the sides to release the layers..Serve hot with spicy side dish.. This is a quick and tasty brittle made with peanuts. Raw peanuts are roasted till golden brown and ground into coarse powder. Sugar is melted into syrup without using any water. Peanuts powder is mixed with the syrup and poured on a greased plate to harden. Makes: around 10 (2 x2 inch) pieces of Peanut Brittle. Grease a glass flat dish with ghee. Alternatively use the counter top in the kitchen to do the same. Sprinkle the sesame seeds on the ghee. Roast the raw peanuts on heavy bottomed pan till golden in color. Cool the roasted peanuts to room temperature and grind them into coarse powder using a spice blender. Heat a heavy bottomed vessel like a thick pressure cooker on medium high heat. Add sugar and stir till the sugar just melts without any particles left. Immediately stir in the peanuts powder and remove from heat. Immediately pour the mixture onto the greased plate and trowel to equally flatten the mixture. You can also use a flat bowl greased with ghee to press the mixture uniformly. Let the mixture cool completely to room temperature (around 5 minutes). Break the solidified mixture into pieces or cut them into squares. Store peanut brittle in a dry jar and it stays fresh for couple of months. Notes: Make sure not to delay the process once the sugar melts. Suggestions: If the sugar doesn’t melt quickly, increase the heat but make sure to stir and use a heavy bottomed vessel. Variations: You can also look at the recipes made with peanuts here. I couldnt stop myself adding anardana seed powder in my recipes nowadays,i love the slight tanginess given by this anardana seed powder whenever they are added in a dish..This time i tried out this dal with lauki, few spices along with moongdal,masoor dal... this dal curry tastes awesome with slight tanginess and goes prefect for lunch with rice and papads, loved this dal and enjoyed even with rotis for our dinner..I prepared a special spice powder by dry roasting coriander seeds, peppercorns, cumin seeds, dry red chillies, grated coconut and anardana powder..This spice powder spiced up prefectly this dal curry and turned out this dal bit dark coz of the addition of anardana seed powder...Sending this dal curry to AWED-Anardana Seeds guest hosted by Jayasri,event by me..
Dry roast all the ingredients in simmer and grind as fine powder..Meanwhile take the washed moongdal, masoor dal, chopped bottlegourd pieces, chopped onions, chopped tomatoes,slit opened green chillies in a pressure cooker with enough water and turmeric powder,cook upto 3whistles and put off the stove, once the steam get released add enough grounded spice powder,salt,garam masala and cook in simmer for few minutes, finally lets splutters the mustard seeds, urad dal, curry leaves and add immediately the tempered spices to the cooking dals.. Recently when we went to snack at an Indian restaurant in our neighborhood, I noticed that they had a good collection of sweets and snacks in the anticipation of Diwali customers. I thought of buying a mathri packet there and somehow backed out at the last minute after going through the ingredients. Mathia flour along with maida and sooji were being used. I had no idea what the first ingredient was and so after coming home, checked online to find what it was. In the process, I found out that many of our dear friends have prepared wonderful mathris without the mathia flour. I went ahead and so made these delicious savory snacks without it. I prepared a spicier version and they turned out crispy, flaky and (some what) melt in mouth kind. They were literally a treat for our taste buds and were a hit even with my son's friends (read non Indian) at school. 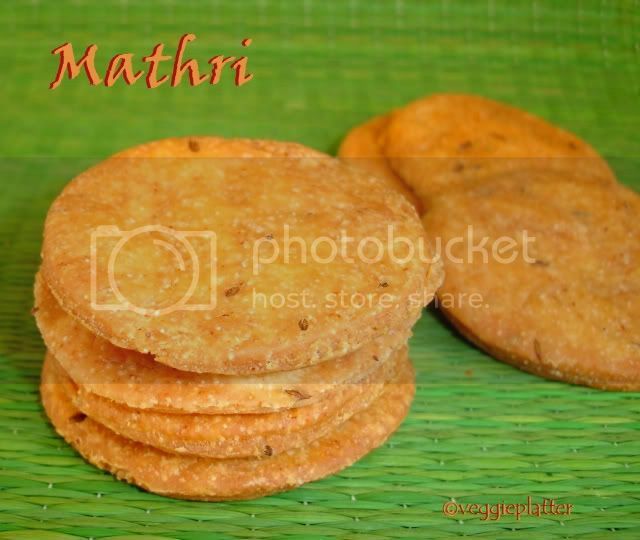 Mathris are a great teatime snack or an opt one for a festive occasion like today. They are said to be originated in the state of Rajasthan. It is a mandatory food item prepared on all auspicious occasions there. Mathris are usually served with pickles. Mix all the ingredients except the oil to fry in a bowl. 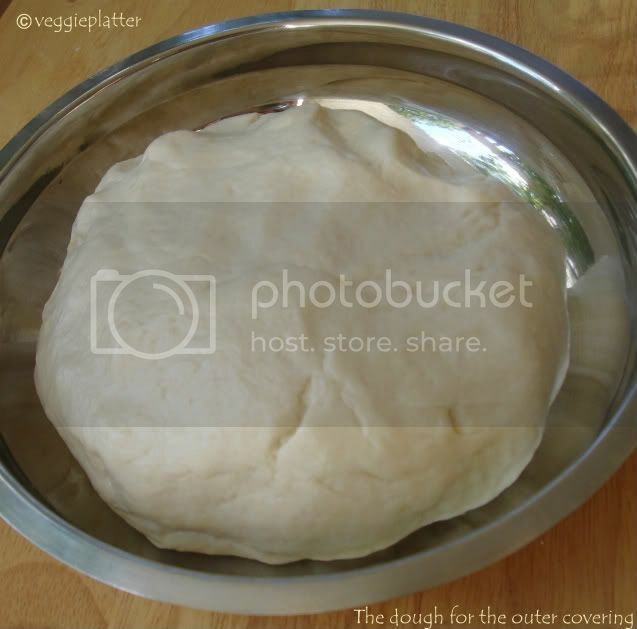 Add sufficient water and make a firm dough like poori / roti dough. Now comes the workout for your upper body. Take a small portion of the dough and roll out into a thin circle of about 2 & 1/2 to 3 inch diameter. Prick with a fork randomly, to avoid the mathris puffing up while frying. You can roll out and use a cookie cutter if you prefer your mathris to be of same size. Roll out some and keep aside. Meanwhile, heat oil in a wide and deep-bottomed frying pan. Add the rolled out dough circles to the hot oil gently. Without crowding, fry as many mathris as the pan could fit. Keep turning them around and fry on low flame till they turn golden brown and crisp throughout. Remove them with a slotted spoon and drain them on absorbent towels. Repeat the process with the remaining dough. Idli batter is prepared with idli rawa and urad dal. Choice of raw vegetables are finely chopped. Idli batter and the chopped vegetables are layered in the idli moulds and the idlis are steamed till soft and fluffy. Serve vegetable idli with any spicy chutney of your choice. Wash the bell pepper and cilantro. Finely chop the carrots, bell pepper and cilantro. Lightly crush the ginger and green chiles with a pinch of salt. Mix all these ingredients in a small bowl. Place around a tbsp of the mixed vegetables in the idli mould. Layer few tbsps of the idli batter on the vegetables. Finally layer few tsps of the mixed vegetables on the idli batter. Repeat the same with remaining moulds. Apply a drop of ghee to each idli to avoid them drying out before serving. Serve vegetable idli with any spicy chutney of your choice. Notes: Refrigerate the remaining batter for next time. Suggestions: If the idli is still wet inside, steam them for couple more minutes to cook through. 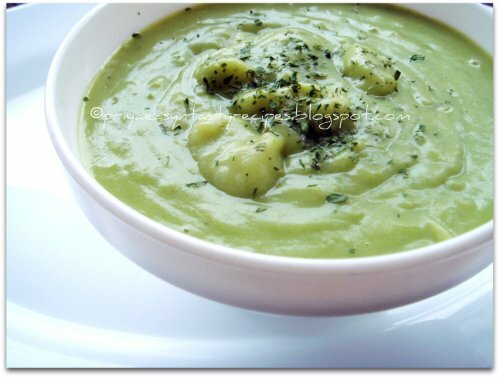 Variations: You can also add your choice of vegetables like peas, potato, beans etc..
Avocado is ground into paste along with spices. The avocado paste is then whisked with yogurt and tempered with spices. Serve avocado raita chilled with roti or parata. Halve, discard seed and scoop the flesh out of the avocado. Roast cumin seeds in a pan on low flame till aromatic and remove from heat. Soak garlic in hot water for a minute or two and roughly chop it. Wash and roughly chop cilantro. Grind green chiles, cumin seeds, garlic and cilantro into paste. Whisk yogurt with avocado paste and adjust any seasonings if required. When mustard seeds start spluttering, remove from heat and cool to room temperature. Add the tempering to the avocado yogurt bowl and stir well. Serve avocado raita chilled with roti or parata. Notes: Refrigerate the avocado raita and it stays fresh for couple of days. Suggestions: Make sure to grind the green chiles and cumin seeds before adding the avocado. Variations: You can also add chopped onion or grated coconut to the raita. I usually make bittergourd as simple stir fry using sometimes with prawns, but this masala is completely a new dish which is prepared actually for filling and making out some paratha with this bittergourd masala, but finally me and DH finished them with rice and boiled eggs also needless to say that this bittergourd masala goes terrible awesome along with rotis too,i never tried adding ginger garlic paste along with bittergourd and also i used Poppy seeds & quinoa spice powder while making this masala..This masala tastes fabulous and we loved it.. Whenever i feel lazy to cook i immediately go for one pot meal that too along with veggies, coz personally i feel that making one pot meal with different veggies was quite one of the best and better way to feed my family with veggies, this time i prepared this simple and delicious quick rice with sauteed cauliflower and green beans with already cooked basmati rice..This rice is really very quick, easy and suits prefectly awesome as lunch box menu..This rice along with spicy potato fries tastes simply delicious and we enjoyed it for our today's lunch..
Chettinad cuisine are always famous for their spiciness and for the dishes cooked with freshly grounded masalas, its quite a famous South Indian cuisine, we guys love anything from Chettinad cuisine..Yesterday i prepared this fish gravy as Chettinad version..Freshly grounded masala turned out this meen kuzhambu very fabulous and this slightly thick gravy suits absolutely prefect with rice, idlies or with crispy dosas..If u want to serve this kuzhambu for ur dinner,prepare this gravy atleast before 5hours, so that the fish soaked in this gravy tastes simply delicious,this gravy tastes even better if u enjoy them the next day..This is one of my Hubby's favourite, he love this Chettinad meen kuzhambu with papads, his favourite combo..
Heat the heavy cream and milk powder in simmer,cook until they turns as thick dough(the dough gets off completely from the vessel)..now makes sugar syrup with sugar,1/4cup water, saffron strands as single string constitency, add the almond powder, sugar syrup to the milk powder dough in a heavy bottomed vessel and cook until they turns thick, pour this mixture to a greased plate or else in a plate lined with wax paper, sprinkle the nuts over the burfi and let them cool completely..Slice this burfi as u desire and enjoy them atleast after an hour.. 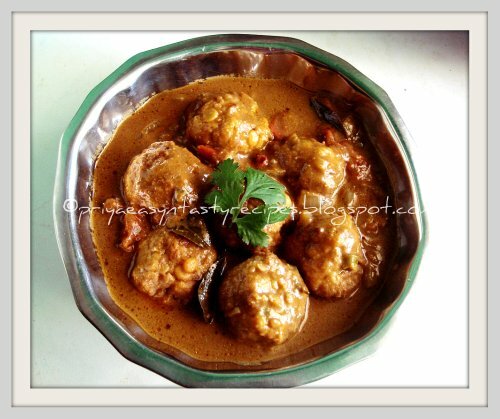 I have prepared this tangy gravy few days back with Steam cooked banana blossom dumplings, this gravy tastes awesome with hot steaming rice and papads or either with hard boiled eggs, actually these dumplings can be enjoyed with any hot sauce for snacks, since i finished them more than as i expected i was pulled to make some gravy with those leftover dumplings, i dont regret for making this gravy with those dumplings coz am a great fan of paruppu urundai kuzhambu and i can survive with this gravy for a week or more than that, yep these gravy tastes terribly awesome even after a day, which i prepared quite a different way from the usual tamarind based gravy, i used a grounded paste prepared with poppy seeds, peppercorns, shallots and coconut for making this gravy..Also needless to say how banana blossoms are healthy with numerous medicinal values, if quite advised to have atleast twice a month this healthy veggie as anything in our menu..Making this veggie as dumplings is quite definitely a best way to enjoy this healthy veggie..Sending this gravy to CWS-Poppy seeds guest hosted by Sudeshna, event by me..